​Fully approved and licensed by DEFRA for animal activity under the Animal Welfare Regulations for Dog Day Care. At Pawprints Dog Day Care, our mission is to give your dog a safe, loving and fun environment. We want to be the number one dog care provider of choice and give you peace of mind, knowing that you are leaving your dog in the safest of hands. We promise that your dog will receive all the love and attention it needs, and we’ll be your dog’s home away from home. ​5 reasons to choose us! 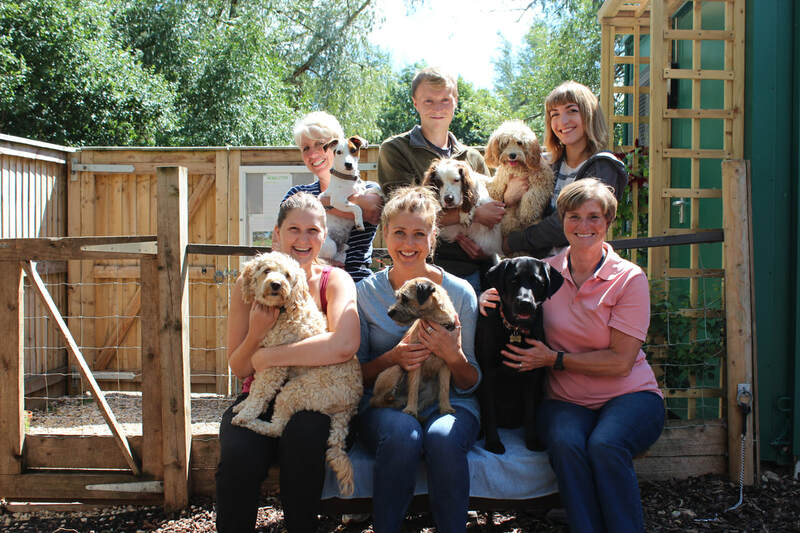 Licensed by DEFRA and granted a 5 star rating, we are the first dedicated dog day care centre in Cheltenham and continually improve and upgrade our facilities and services. We’re proud to lead the field! We have a number of secure areas for the dogs ensuring we can cater for all types of dog and their individual needs. We have an indoor play arena, two all weather arenas. two grass paddocks, a permanent agility/parkour course and x4 quiet snooze rooms. With x7 fully trained and passionate staff there is plenty of individual love, care and attention for every dog. We only accept social, friendly dogs and if we are not sure about a dog, for safety reasons we may politely decline. ​What clients say about us! Cassius our 9 month old husky pup LOVES pawprints! He howls and wines in the morning because he knows where he is going. He is such a sociable dog so this is heaven for him! Thank you to ALL of the staff for being able to handle his energy! I've used PawPrints for nearly a year and I can't recommend them enough. The team are fantastic and the service they offer is above expectations. My dog loves going to Pawprints, he starts squeaking as soon as we drive up to the car park. Lorraine and the staff are great, and very skilled at working with all types of dogs. My dog always comes home happy and worn out from an exciting and fun day with his human and dog friends. It's so good to know that not only is he being well looked after, but he's also having a fantastic time. Thoroughly recommended! ​Lorraine and all the team are absolutely fantastic! Pepper has been going since she was 13 weeks old and it has been absolutely brilliant for her. She is so well cared for and we are so pleased to have found such a wonderful place. Thank you so much, I cant recommend Paw Prints enough!!! I absolutely love Pawprints dog day care! The whole team are fabulous, caring and such lovely people and Teasel adores her days here. She has been coming since a young pup and it’s such wonderful socialisation for her. She’s very excited when she turns up in the morning and then sleeps well that night! Its such a great idea, i didn’t even know such a thing existed until we got her (and wished it had been around for our previous dog) I cannot recommend it more highly. I'm really impressed with PawPrints! Our spaniel Delphi has just the best time - her tail's wagging on arrival & she can't wait to be with the other dogs. I love seeing the pictures on FB & Instagram as I can see how happy & well looked after all the dogs are during the day. I'm very happy leaving her with Lorraine & her team - it's obvious they're dog lovers & that makes me confident Delphi's being taken care of. Twix loves every second at paw prints - I couldn't ask for a better group of people to be looking after my girl , Lorraine and the team are fab, always have the best interests of the pups at heart and know exactly how to deal with a sassy GSP! Couldn't recommend anywhere better! ​Our JRT, Frankie, has been going to PawPrints once or twice a week since he was four months old. He loves his time there - he's thrilled to arrive, enjoys games and affection all day, and then comes home tired and happy. Lorraine and the team are very attentive, and give us plenty of information about his activities during the day - it's clear that they all understand dog behaviour well, and keep a close eye on the day care attendees. I highly recommend PawPrints, and can't think of a place where I'd be happier to leave my dog for the day! ​in our care so you can see what your pup is getting up to! ​Follow our instagram page for some of our best photos of your dogs. ​We love your dogs as much as you do!